Data from approximately 40,000 papers published in 69 journals of Evolutionary Biology and Ecology from 2000 to 2015 were collected and analysed. For detailed methodology and results please see below. Data were collected using the Elsevier API program, which allows access to summary data from all scholarly journals indexed by Scopus. We used the Scimago Journal Ranking system (SJR) to get the list of the top 100 scientific journals subjected in the ’Ecology, Evolution, Behavior and Systematics’ category. For the journals included in the Scopus database, we downloaded all papers issued between 2000 and 2015, trough the pyscopus package. For each paper, we gathered information on: the first names of all authors, the publication date, the number of references and the number of citations each paper received by the date of download. All our data were collected between the 20th and the 22nd of January 2017. Based on the authors’ first names we identified the gender of most of the authors in the dataset, using the package ‘genderguesser’ in python. Only papers with all their authors’ genders identified as male or female were included in the analysis. 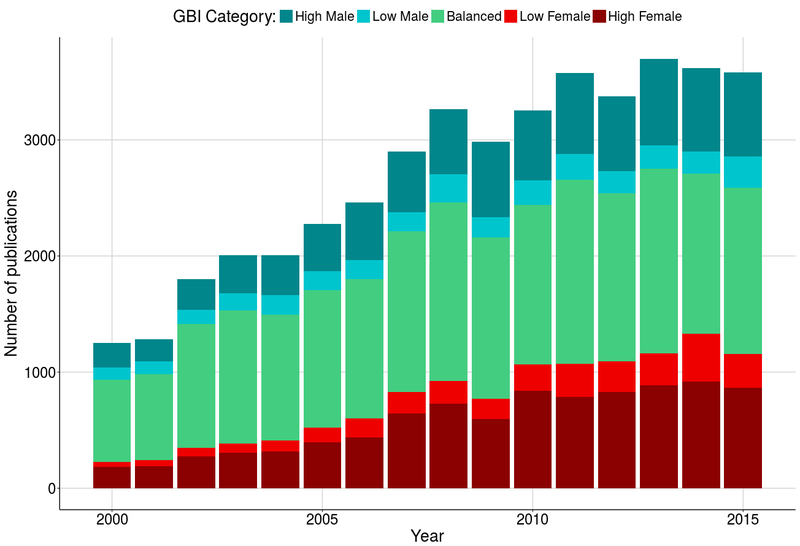 We then created a Gender Balance Index (GBI) for each paper, with range between 0 and 1. The GBI is calculated from the proportion of women in each authors group, by estimating the mean of the group after assigning values of 0 and 1 to every male and female author respectively. 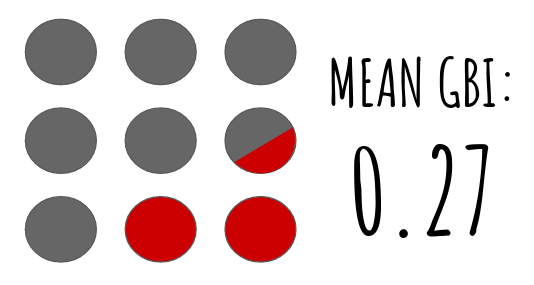 Consequently, values of 0 and 1 will represent papers with only male and only female authors respectively, whereas the value 0.5 papers with equal representation of both sexes. Furthermore, we created five GBI categories by grouping papers with values: < 0.2, 0.2-0.4, 0.4-0.6, 0.6-0.8, 0.8 <, into high male dominated (HM), low male dominated (LM), balanced (B), low female dominated (LF), high female dominated (HF) categories, respectively. By this way, we could better spot differences in the dominance of both sexes in authorship through time. 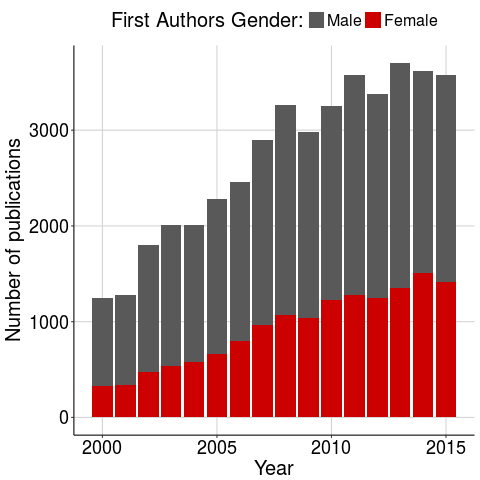 The number of male first authors seems to be more than twice the number of female first authors, representing the 68% of all first authors with approximately 26,000 men and 13,000 women first authors. The gender ratio of the pool of all authors is equal to 1.9, close to the one of the first authors group, meaning that there is no bias in the first authors position. 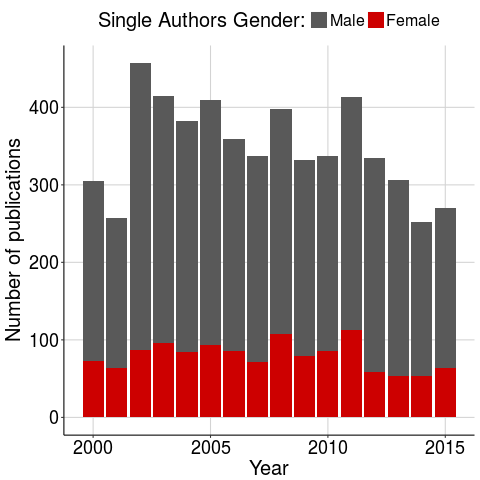 The ratio of male versus female last authors is much higher, equal to 3.58, with female authors being only the 21.8 % of the all last authors. The mean GBI of all papers was equal to 0.27, with a dominance of the high male category through all the years. More data and results are coming up soon, stay tuned!